Lightning and parched conditions have sparked multiple wildfires in northern Alberta. 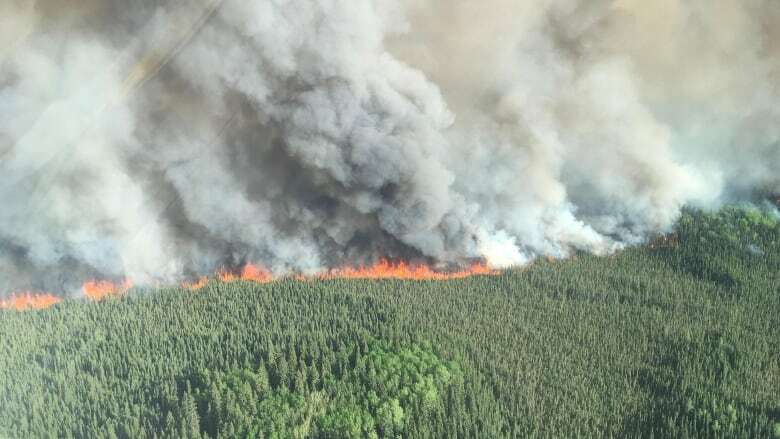 This week's parched conditions have sparked multiple forest fires in northern Alberta, pushing the wildfire threat to extreme in the Fort McMurray and Lac La Biche regions and putting one small community on evacuation alert. "We are on extreme right now for fire danger," said Lynn Daina, Fort McMurray's wildfire information officer. "Our grasses, our fine fuels are tinder dry. So they will ignite and spread quickly." The persistent heat and arid conditions are expected to remain over the next few days in the region, which is still recovering from the devastating 2016 wildfire that forced 80,000 people in Fort McMurray to flee for safety, and caused more than $3.7 billion in damage. Residents in Janvier, a hamlet south of Fort McMurray, were told Wednesday night to prepare to evacuate from a wildfire burning 10 kilometres from their community. A provincial alert and a press release from Wood Buffalo municipality said the hamlet is not immediately threatened by wildfire and residents should be prepared to leave if an order is issued. Alberta wildfire and Wood Buffalo Regional Emergency Services are responding to the fire, which is moving toward the access route to the community of 155 residents. Alberta Wildfire expects more flare-ups in the Wood Buffalo region and the Lac La Biche forested areas. "There is potential for this to escalate," states an update posted Tuesday on the Alberta Wildfire website. Most of the wildfires were sparked by dry lightning, Daina said. Alberta Wildfire is tackling four forest fires in the region. The fire that is threatening Janvier is located northwest of Conklin, which is about halfway between Fort McMurray and Lac La Biche. As of Tuesday, that fire was about 100 hectares and classified as out of control. Bulldozer guards have been built in locations accessible to tractors, and crews have been dropping water and fire retardant. The largest fire, about 150 kilometres northwest of Lac La Biche, was covering about 1,000 hectares and was also classed as out of control. Other than Janvier, the wildfires in the Lac La Biche area are not posing a risk to any other communities. However, an Alberta Wildfire information officer for that area says trap lines, cabins and small oilsands operations are under threat. "Right now there are a few plant sites, well sites, compressor stations that could be jeopardized by the fire," said Leslie Lozinski, the Lac La Biche wildfire information officer. "We are also getting a lot of calls from hunters with trap lines and trap cabins that could be jeopardized." The province has imposed fire restrictions beginning at the southern boundary of Big Lakes County, north of Peace River, within Wood Buffalo National Park, the Lac La Biche and Fort McMurray areas. Fire permits have been suspended and backyard fire pits, random campfires, charcoal briquettes, turkey fryers, torches, exploding targets and fireworks are banned. Propane fire pits, gas stoves or propane BBQs can still be used in communities and in back country and camping areas. David Thurton is a national reporter in CBC's Parliamentary Bureau. He's worked for CBC in Fort McMurray, the Maritimes and in Canada's Arctic.